Sunset Beach Florida is laid back until Spring Break when sparks fly! 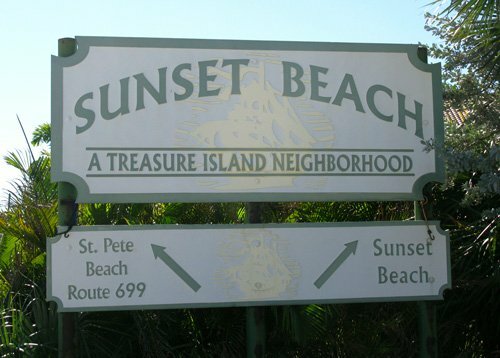 Sunset Beach Florida is located on the southern-most tip of Treasure Island. 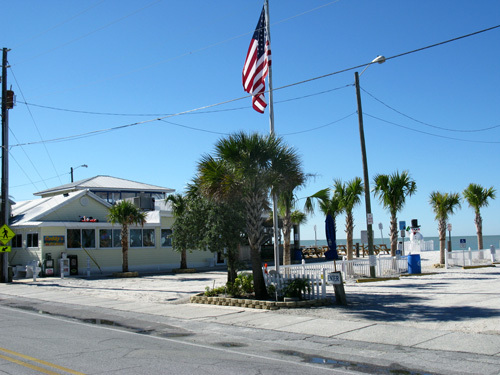 It is a small community of diverse outlooks, one of the most relaxing Florida beaches ever, and controversial Caddy's Beach Bar. 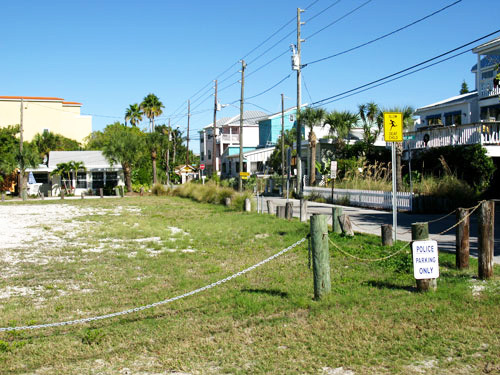 Sunset Beach is a narrow barrier island about a mile long and a 1/4-mile wide on the west fork of Gulf Blvd. However, on that small bit of sand, cultures collide like bumper cars...especially during Spring Break. Crusty and taciturn locals, who are being bushwhacked by unrealistic property taxes and hurricane insurance...and just want to be left alone...are continually being pushed out by retired professionals with tidy pensions who like to drive convertibles and walk their poodles. Add in the irresponsible Spring Break college crowd that camps at Caddy's each night from March to the middle of April, and you have a pretty combustible bit of human drama. Despite the dynamics of the community, Sunset Beach is extremely quiet and relaxing. You can have breakfast at Caddy's, take a walk around the Sunset Beach Boardwalk, have a swim...then return to watch a magical Florida beaches sunset. It really doesn't get much better. Sunset Beach is easy to find. 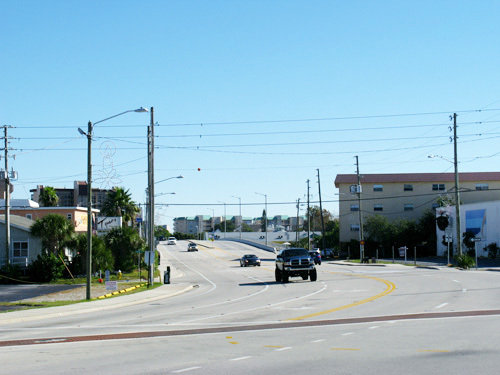 The sign to take the west fork of Gulf Blvd is pretty big. 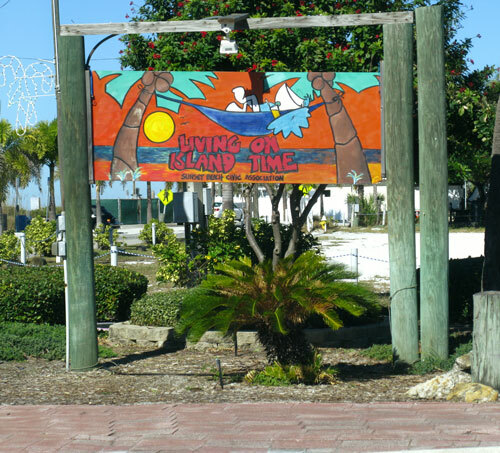 "We've been coming to Sunset Beach Florida each winter for the past 15 years," said Lyn Waltron, from Buffalo WY. "It's a quiet, very pretty area. We used to rent directly from the owners, but now we go through AirBnB. We've gotten some great, low rates for an entire condo. A couple of times, we got a whole house for only $90 per day. It sure beats a hotel because you save so much by cooking your own meals. We love the easy pace and the extreme quietness. Each week, we walk to breakfast at Caddy's on most Tuesdays and Thursdays." 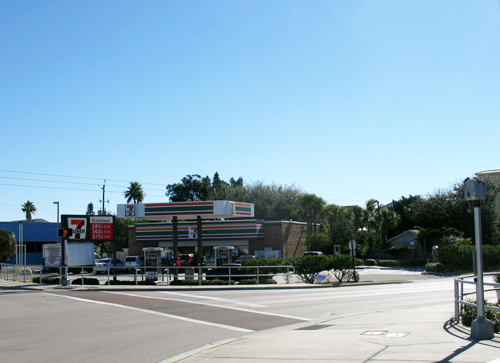 Take the turn to the right at the 7-11 store. 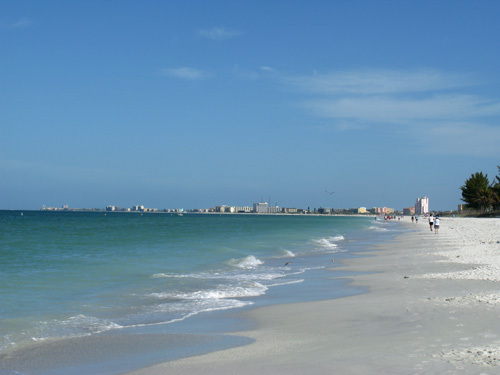 If you go left, it will take you across Blind Pass Bridge to St Pete Beach FL...which is pretty much Party Town, USA. There is a beautiful small park (Sunset Vista Beach) right at the turn...but it has NO parking spots. 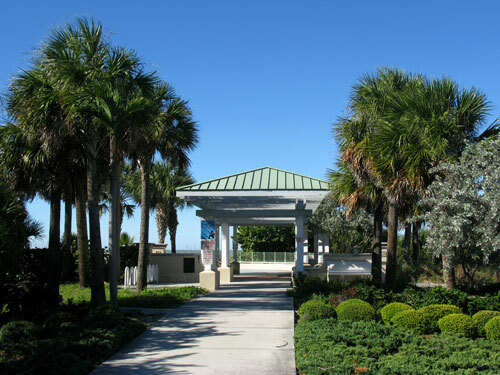 George Harrell from Pittsburg, said, "We never could figure out this little Treasure Island park on Sunset Beach. It's a beautiful little place. Very quiet. But there is no parking. We finally got the idea that this is kind of like a sanctuary for people who walk the beach. You can come and sit down. You don't have to worry about problems in a parking lot. It even has a shower to wash the sand off your feet if you want to walk back to the 7-11 on the sidewalk." 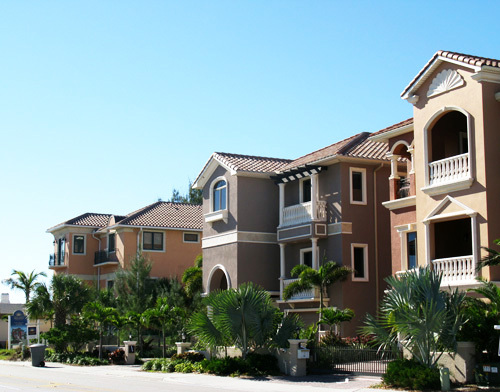 You will immediately notice the huge condos on the Gulf side as you make your turn. Jeni Lewis, from Bozeman MT, said, "These are beautiful condos. We got one through AirBnB for a very reasonable rate. We love being able to sit outside on a pleasant January evening while our friends are snowed-in, back in Bozeman. The beach out back is just beautiful. We walk from one end of Treasure Island to the other, almost every day. This is such a relaxing beach. 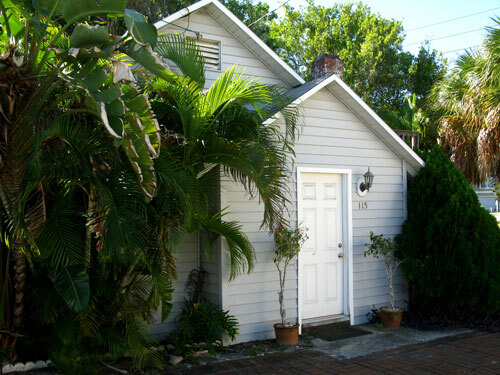 Very easy to recharge your spirit here in Sunset Beach Florida." They are in direct contrast to the accommodations about a 200 yards to the east on Harrell Avenue. 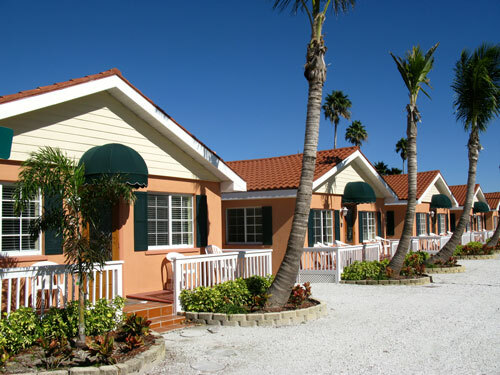 ...in direct contrast to the efficiency apartments rented for about $600/month down by Sunset Beach Pavilion. Joe Henry, from Lansing MI, said, "This place cracks me up! It reminds me of a Ripley's Believe It Or Not museum. You would not believe the collection of interesting and nutty stuff in this apartment complex. Can you imagine walking out the door each morning to some of this stuff? 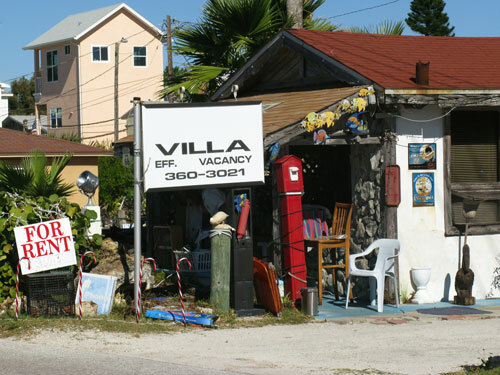 If you are vacationing down here, make sure you stop by. It will really be worth your while." You'll see Caddy's on the right hand side, where the up-scale crowd likes eat and watch the sunset...EXCEPT during Spring Break. 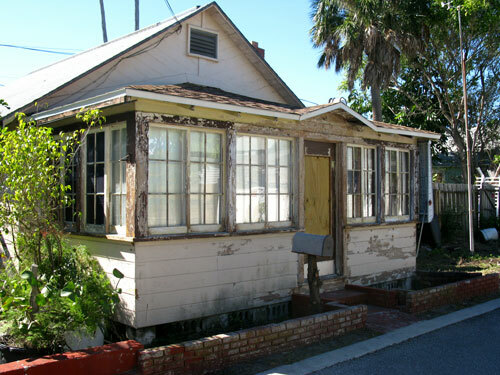 Pete Edwards has lived on Sunset Beach Florida for 11 years. He's pretty much an authority on most things here in south Treasure Island. "Look, I'll be honest. I love having breakfast here at Caddy's, and I love eating a big salad and watching the sun go down in the Gulf. But not during Spring Break. From the middle of March to about middle of April, the target age group is between 21-25. Maybe some losers in their 30's thinking they can pick-up some drunk college girls, but basically it is just like a college campus here. Caddy's gets real crowded, and the clientele can get a little boisterous. It's not for me, but hey, I'm 66. 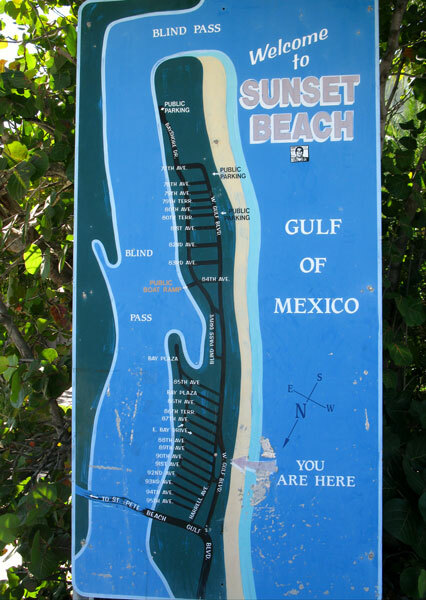 If you are in college, Sunset Beach is a great place during Spring Break." 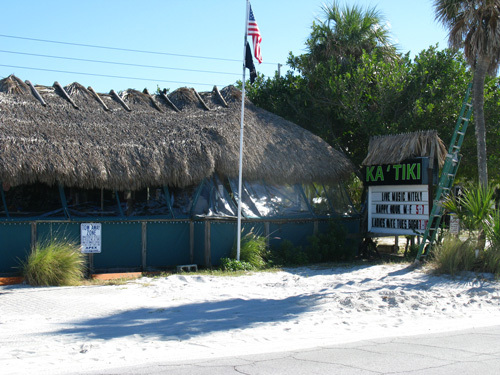 The locals, who have been on Sunset Beach for a couple of generations, like to hangout at Ka'Tiki Bar right across the street, on the east side. Just south of Caddy's, in Brown Pelican parking lot, is a nice map of the island. 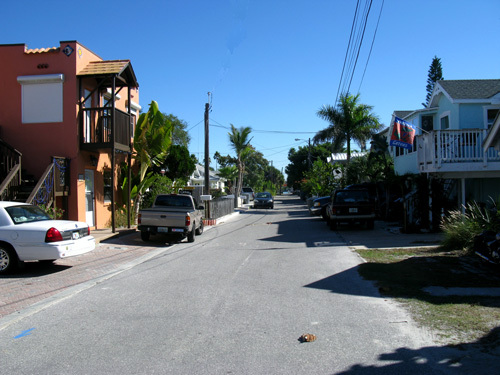 The cross streets on Sunset Beach show you even more of the differences in living structures on the island. 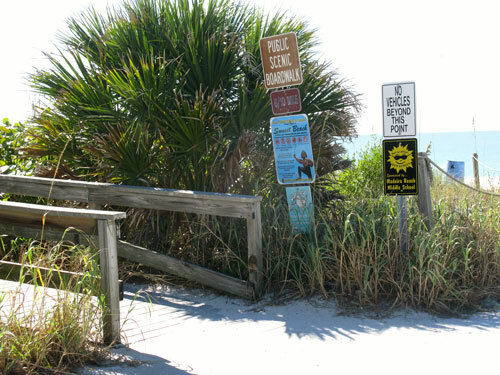 You'll know you're at the end of Sunset Beach when you reach the Scenic Boardwalk. While the relationships of the neighborhood may be a bit strained from time to time, the beauty and laid-back feeling of the beach dissolves all of that. 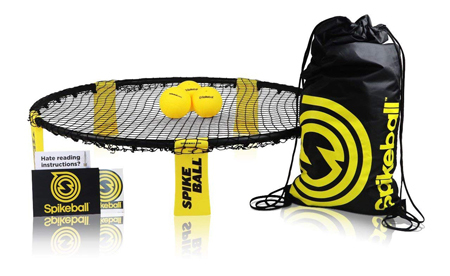 SpikeBall is the new, fun game that is taking the beach by storm! All ages can enjoy it. You can be a competitive as you wish.